Piggy-backing on the recent launch (and massive funding) of SoFi, a new startup is launching today that wants to breathe some fresh air into the broken, complex and molasses-slow student loan system. 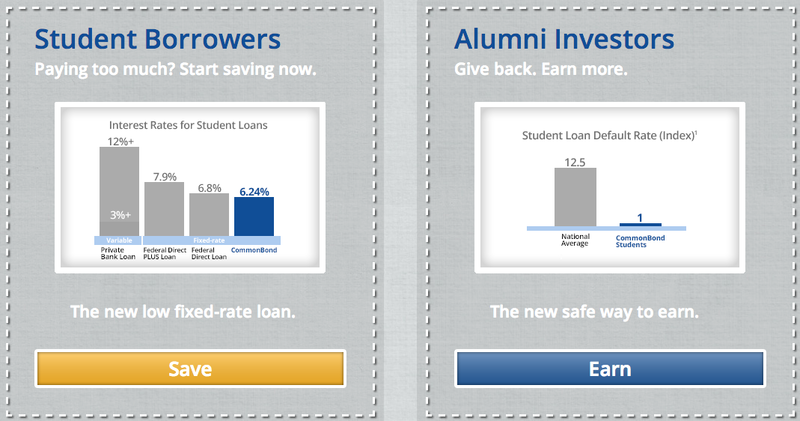 New York City-based CommonBond aims to bring the power of crowdsourcing to bear on student debt by connecting student borrowers and alumni investors and offering loans at a lower fixed rate than what they’d find with Uncle Sam. To help kick-start this initiative, the startup announced Friday that it has raised $3.5 million in outside funding. The three CommonBond co-founders — CEO David Klein, CFO Michael Taormina, and Advisor Jessup Shean — are former students at the University of Pennsylvania and/or Wharton, and so the startup has raised $2.5 million from alumni investors to disburse to students in the form of loans. They raised an additional $1 million from angels to capitalize its business. Why does this matter? Well, because you’ve heard this story before: The price of a college education has become unsustainable. Thanks to today’s ridiculous tuition inflation, student debt is at a record high. Recent graduates are increasingly finding themselves underemployed (if not unemployed), and graduation rates are slipping as a result. In turn, when students do need to subsidize their education, they’re forced to deal with some pretty unattractive options in the loan department. Federal loans come with high, fixed interest rates and private bank loans, while variable, are even worse — coming in somewhere around 12 percent. More broadly, anyone looking for a personal loan (to say, pay off credit card debt) finds the same ugly reality. That’s why we’ve seen a big rise in the popularity of peer-to-peer lending platforms of late, with companies like LendingClub and Prosper leading the way. P2P lending platforms essentially look to crowdsource investment (from individuals, institutions, etc.) in people’s loans, connecting people who want to borrow money with those who want to invest in something with steady returns. The bonus? Cutting out the bank as the middle man. Naturally, there are many who believe that this P2P, crowdsourcing model can work just as well in education for student loans. Really, anything even slightly better than the current standard will be a huge improvement. And CommonBond is off to a good start, though it’s still early. The company is initially targeting MBA programs, specifically Wharton, where it will fund as many as 100 of its MBA students this semester, before expanding nationally beginning next year. 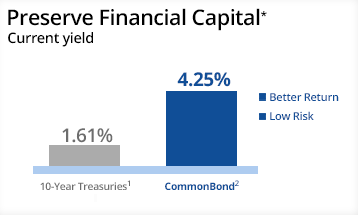 Under CommonBond’s model, students pay a 6.24 percent fixed interest rate, amounting to what the co-founders believe will be the equivalent of $20K in savings over the course of loan repayment. This is compared to traditional alternatives, like federal loans, which tend to come with interest rates around 8 percent. On the other side, alumni investors can expect an annual return of over 4 percent, the company tells us. It’s not quite as attractive to investors as some of the loan options at, say, LendingClub, but it’s enough to make investing in student loans — traditionally not something that has been appealing to or even on the radar of — individual or institutional investors. Because of the comparatively high bank or federal loan rates, students end up paying their debt off over years, and many end up defaulting — so what investor in their right mind would want to invest? Peer-to-peer and crowdsourced debt investment and repayments of this kind are still relatively new to the average consumer, so the barrier to entry can be a bit higher. There are risks, no doubt. [See Peter Renton’s analysis for more.] Beyond defaults, there’s the issue of not hedging by remaining diversified, changes in interest rates and regulation — the latter of which there are bound to be at some point very soon. But, that being said, the P2P lending industry as a whole is gaining popularity and is being validated, in part by increasing interest from institutional investors. Plus, students want to get out of their debt, they don’t want to be paying it off for decades and banks aren’t exactly lending their butts off right now. For education, specifically, it’s all about creating a trusted community and going beyond being a financial resource to develop lasting connections between alumni and students. That could mean professional networking, or events, alongside financing loans. Of course, to do all this and be successful in this space, startups have to raise a lot of funding. CommonBond is just getting started and it’s got some funding already under its belt, but it’s got a long way to go to catch up with SoFi’s $75+ million. That being said, it does have some Warby Parker and TOM’s-like philanthropy going for it: It brings the one-to-one model to education and, for every diploma that is fully-funded on CommonBond, the startup will fund the education of a student in need (abroad) for an entire year. It’s starting that by partnering with the African School for Excellence. What’s not awesome about that? In the end, however, there probably won’t be more than a handful of winners, but right now the student debt problem is enormous — that really can’t be understated — and there’s plenty of green field in the space. Plus, as P2P and crowd-powered lending reach the mainstream, this space is definitely going to become more attractive to investors — venture, institutional and otherwise. As it does, the startups that can provide low rates for students, consistent returns for investors, and develop a secure, value-adding community around lending will do well. That’s easier said than done, of course, but there’s potential for this emerging model to have an enormous effect on education. And that is money in the bank.